3 USB outputs & Dual input. 10-11 hours (5V/2A ac adapter). Digital Camera, Bluetooth Speaker, Headphones, Mp3 Players and More. Over-current, over-charging and short-circuit protection. 1.Press the side button to turn on the LED light. 2.It can turn off itself automatically in nonworking state. 3.Three color LED light indicates the juice of the charger. 1.The solar panel is usually used in emergency due to the limited area of the solar panel. 2.The solar battery pack is 90% efficiency because of power loss, heat loss, loss of the USB cable and your devices. 24 months and life time friendly customer service. Lightning & Micro Dual 2.4A Input: Dual input enables the solar portable charger to get recharge with Android cable or iPhone cable about 10-11 hours with a 2 amp adapter. 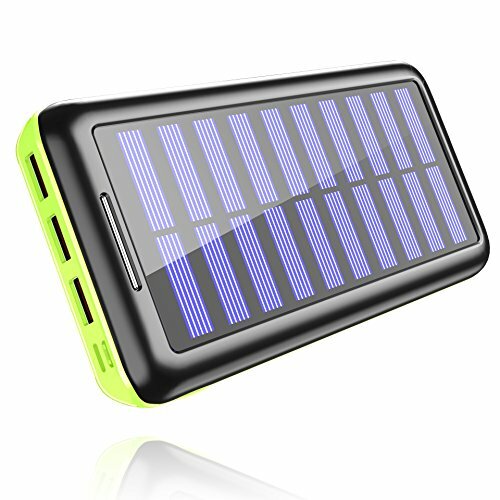 Fastest Charging Output:The solar power bank has 3 USB ports, allowing 3 devices charge simultaneously at the optimal charging speed (5V/2.4A) around 1 hour. High Capacity Power Bank: 22000mah charge your iPhone X/8 about 8 times, iPhone 8 plus over 6 times, Galaxy S8 up to 5 times, or an iPad Mini more than 3.5 times. Solar Charger Function: equipped with a compact solar panel, which could charge the portable phone charger via sunlight in emergency, perfect for outdoor, long flights and road trips. What You Get: Aikove 22000mah portable power bank, micro USB cable, instruction mannual, free 24 month warranty & friendly customer service. (How to reach out customer service: Go to Your Orders, find your order in the list, and click Get help with order). If you have any questions about this product by Aikove, contact us by completing and submitting the form below. If you are looking for a specif part number, please include it with your message.